The diversity and distribution of mushrooms and other macrofungi intrigue both amateur mushroom hunters and professional mycologists. 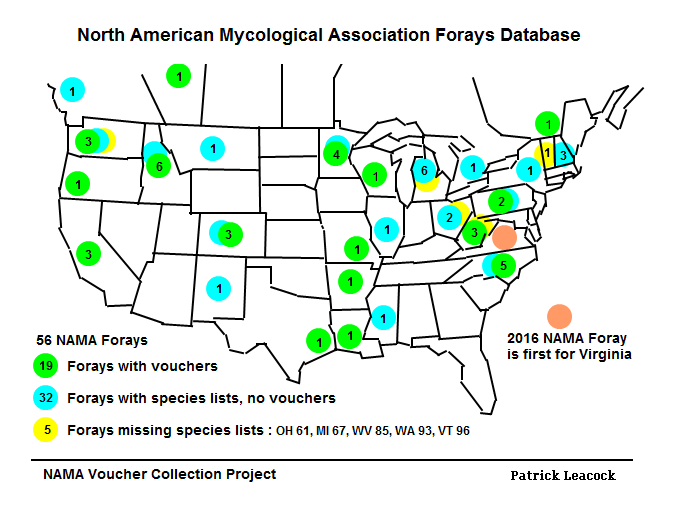 For over 50 years the North American Mycological Association (NAMA) has sponsored forays that have recorded species occurrence across this continent. 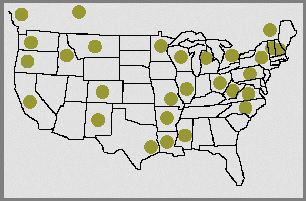 This web site contains data for fungi collected across America at the annual NAMA forays. The history of North American Mycological Association annual forays begins in 1961 with the Portsmouth, Ohio foray hosted by C. W. Ellett. The first seven forays (1961-1966) were sponsored by the People to People Committee on Fungi, the predecessor to NAMA. There were 37 yearly forays held 1961 through 1996. Species lists from past forays provide data on the distribution of species and the recurrence of species within states that have hosted multiple forays, thereby enabling comparison between states and provinces over time. See Analysis. Starting with the 1997 foray, the newly formed Voucher Collection Committee has documented the species of fungi identified on the annual forays with collection data, photographs, and dried specimens housed at the herbarium of the Field Museum of Natural History (F), Chicago, USA. 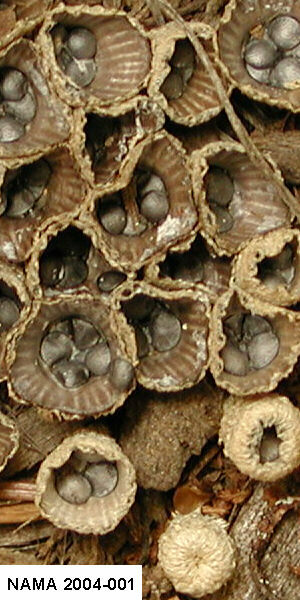 These collections are valuable for preserving a record of the diversity and occurrence of fungi across North America. One of the many notable specimens is the Holotype of Russula avellaneiceps (NAMA 1997-210, F) a new species published by Ray Fatto 1999 (Mycotaxon, Vol. 70: 167-175). For this and other featured species, see Selected Fungi. Acknowledgements. Yearly support provided by: North American Mycological Association. Partial support provided by: Field Museum of Natural History (Museum Collections Spending Fund, Webber Family Research Fund), and Illinois Mycological Association. © Copyright North American Mycological Association 1997 - 2015. All rights reserved.